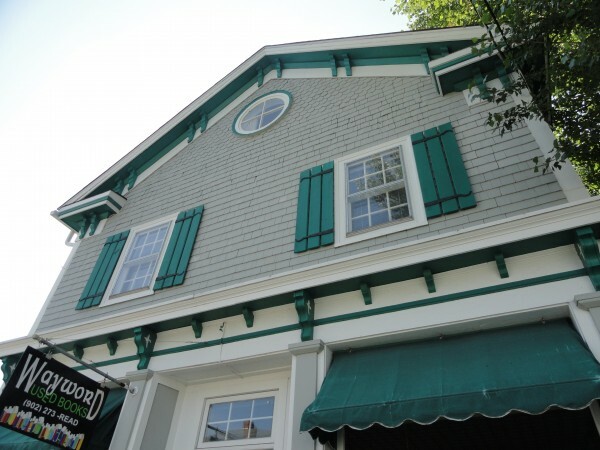 Every year, the Chester Municipal Heritage Society coordinates and hosts a wonderful tour of properties in this sea coast town. The August 20, 2011 slate of homes was another successful event and organizers should be proud of their work. The tour was comprised of eight properties and a boat excursion. The latter component provided unique harbour views (as well as the captain’s views) of the area’s architecture. The tour properties spanned three centuries of house construction in Chester. The Zoé Vallé Memorial Library was one of the tour properties and is a remarkable treasure. The c1899 Judge Williams House, 187 Central Street, showed visitors how its owners built a new addition at the rear. On the top of Prince Street, “Hackmatack” is a contemporary house with an exterior that was designed to blend in with older neighbourhood structures. Each of these properties as well as the other gems I haven’t mentioned provided a unique and inspirational experience for tour goers. So many communities throughout Nova Scotia hold similar tours. Those that love heritage buildings faithfully look forward to these tours all year long. But what about those that have not yet come to appreciate historic homes to the same degree as the converted? Our province’s home tours, though thoroughly enjoyable, could do more. This article is not a critique of any of the wonderful heritage home tours held throughout Nova Scotia, certainly not the charming experience offered up by Chester, just a loose group of observations and a suggestion to help keep the focus of such tours on historic preservation. All three floors of the historic Cole building at 55 Duke Street (c1830) were part of the 2011 Chester Home Tour. The building was a pharmacy for much of its history but now houses Wayword Used Books. Heritage Home tours are possibly the greatest tool the preservation movement has to educate the public and to foster in local people an appreciation for the architecture of our province. Many of these sorts of home tours fall into one of two categories. First there is the tour that is free and seeks only to educate the public and instill in them a sense of wonder with respect to heritage. Then there is the fundraiser or pay-to-view model where education and heritage awareness are also present but tend to be more exclusive and perhaps even incidental. I would encourage any group that operates the latter formula to try designating just one of their tour properties as free and to really promote that fact. This arrangement need neither diminish the ticket price nor reduce overall revenues. So, with no downside why not try it? Consider the upside. With no entrance fee (for the lone free property), organizers can essentially make it as easy as possible for people to be introduced to the richness of heritage architecture. More bodies through the door means more Nova Scotians potentially converted to protecting our heritage resources and adding their voices to the crescendo heard over threatened buildings, shrinking view planes, and inappropriate development plans. One free home tour is also terrific advertising for the remainder of the tour (and next year’s tour). The curious may become enamored enough to purchase last-minute tickets that will allow them through the doors of all the properties!